The Northern Ireland Music Prize was conceived by the team at the Oh Yeah Music Centre in Belfast and folk representing the BBC, radio stations and some Northern Irish musical institutions and venues. As one would expect there were cries of ‘fix!’ from scenesters and complaints abound about awards for the boys. As it transpired Foy Vance took home the first award in 2013 for his album Joy of Nothing. The award is now six years old and seems to have dispelled many of the myths that met its difficult birth. Subsequent winners have included the dark and wildly entertaining Robyn G Shiels, Derry Citys Soak, the wonderfully gentle Ciaran Lavery, and last years winner Joshua Burnside who was nominated again this year. If the idea behind the Northern Ireland Music Prize is to celebrate the very best of Northern Irish music then its expansion comes as no real surprise. This year includes three new categories for Best Single, Best Live Act, and The Oh Yeah Contender Award. That the event has moved to its new home at the Ulster Hall is a testament to its strength and the quality of the artists involved. In a first for the event, the team behind Oh Yeah have joined forces with Inspire Wellbeing to award Gary Lightbody with the ‘Outstanding Contribution to Music’. Lightbody is being given the award in respect of the role he has played in supporting artists from Northern Ireland. He was instrumental in the inception and formation of the Oh Yeah Centre and by all accounts stepped up to pay the rent in the early days. He also established Third Bar alongside David Matchett, an Artist Development business set up to support Northern Irish artists in the advancement of their careers. Hannah Peel took to the stage to perform tracks from her shortlisted album Mary Casio: Journey to Cassiopeia, complete with a 30 piece brass section. This was an old-school brass band in a Victorian music hall playing synth led sweetness few of those gathered had ever witnessed. The format for the evening appeared to be around handing the gongs out while the stage crew did their best to rearrange and reassemble things on stage. As a first a test of this idea, removing 30 chairs, 30 music stands, a couple of dozen mics and an awful lot of brass may not have seemed like the best thing to do while people were talking not three foot away. While the chaos was more or less contained Rigsy did his utmost to continue. 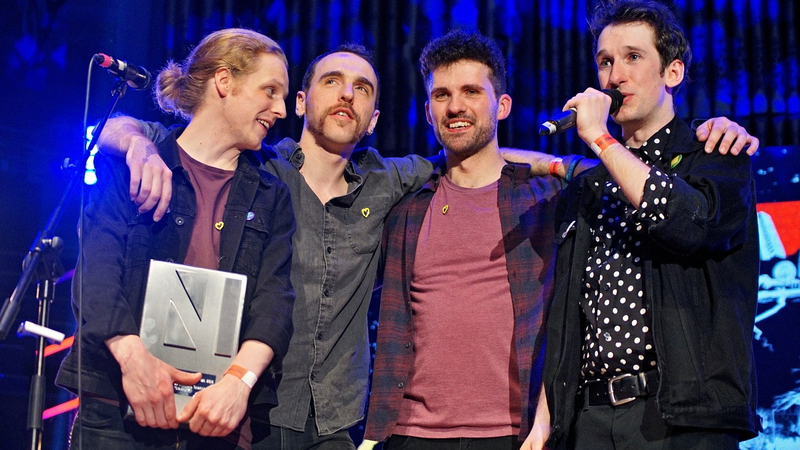 The Best Live Act gong was awarded to the Wood Burning Savages in a shortlist that included rockers And So I Watch You From Afar, the aforementioned font of all energy Brand New Friend, Robo Quartet, and Ryan Vail. After a brief interlude Derry’s own ROE played a short set before heading off to play M pour Montreal, though with that set taking place within a mere 12 hours, we’re hoping everyone managed to calm down a little and catch some sleep as they head across the Atlantic. The Ohyeah Contender award was handed out by BBC Radio 1s Phil Taggart, the award is given to the hottest newcomers of the neighboorhood and was lifted by ROE, who had barely time to gather herself at the side of the stage before being wheeled back on. With ROE and Phil hugging at stage left newcomers to the Xtra Mile homestead, Brand New Friend burst onto the stage and frankly made most of the crowd feel old with a set dripping in energy and verve, the sheer speed they move at is remarkable to watch. With an album doing the rounds and day jobs to make decisions about Brand New Friend are definitely ones to watch. Having won Best Live Act the Wood Burning Savages had a lot to live up to. As much of their shows to date have been around Ireland, we hadn’t had the opportunity to see them play live. It was worth the wait, they more than made up for their success. The deliver a punishing, roaring set that leaves the audience howling along. As politics go many Irish acts tend to avoid being overtly political. Not so for our Wood Burning Savages, they launch into a tirade about the lack of any local government, the lack of human rights, equal marriage, abortion, unemployment, education, pretty much the who gamut comes in for criticism. Not bad at all, worth the silver. At this point of the evening the BBCs’ Mike Edgar, the man responsible for pretty much any content that covers Irish artists on BBC Northern Ireland, took to the stage to deliver the special award to Gary Lightbody. Lightbody gave a speech that covered every angle of an artists struggle, from mental health, unemployment, writers’ block, loneliness, and the need for support for the arts. There was barely a dry eye in the house and Lightbody looked genuinely touched by the accolade. Up next was another Derry child in the shape of Ryan Vail who looked as though he had brought all the lights, lasers and synths he could lay his hands on. To add to the madness the Vail brings to the stage he tried, perhaps in vain, to calm things a little with the Arco String Quartet. It worked beautifully though it was somewhat hard to see with all the lights. Ciaran Lavery recently wowed at the Buyers Club and this evening he performed with a full band, leaving not an inch of space for much else, bar all of Ryans‘ lasers and tech. In a twist to his normal routine, he played out a beautiful twist on the pressure of social media, with the band taking up different positions so quickly it was difficult to tell who was who, that they were all wearing black hoodies made their point. It was too short a set, only three songs, but it was a set that showed how talented the man from Aghagallon is. With time against the crew, the final two awards were delivered back to back. In a new category for this year, and one based on a public vote via Irelands The Thin Air magazine, Best Single was awarded to Kitt Philippa in a shortlist that included most of those already noted and stellar work from the likes of Hot Cops and Arvo Party. The hotly anticipated Northern Ireland Music Award was the one everyone wanted and the gong was handed out by Charlotte Dryden, CEO of the OhYeah Music Centre. (as noticed elsewhere, CEYeeeooo). Charlotte gave an impassioned speech about how far the awards had come in just six years and how much talent her hometown of Derry seemed to be producing, thank yous, congratulations and then it was down to business. In a shortlist that included Islands by Ash, Stains on SIlence by Girls Names, Sweet Decay by Ciaran Lavery, records by Hannah Peel, Snow Patrol, ASIWYFA, Malojian, and Robo Quartet, The Wood Burning Savaged were was victorious for a second time, on the night. To say that this was all a bit much for the lads was an understatement, there were tears and very little sense. Bless. As award ceremonies go this was different, it was by far the biggest production we’ve seen, no doubt supported by the team at the BBC, but the level of talent on display was a joy to behold. If there is any justice in the world it won’t be long before some of them need to invest in tour vans. Words and Pictures by me.